MOMA was almost shockingly quiet this Saturday morning when we visited, a good atmosphere for taking in an exhibit curated by artist Trisha Donnelly that encompassed an eclectic group of works. 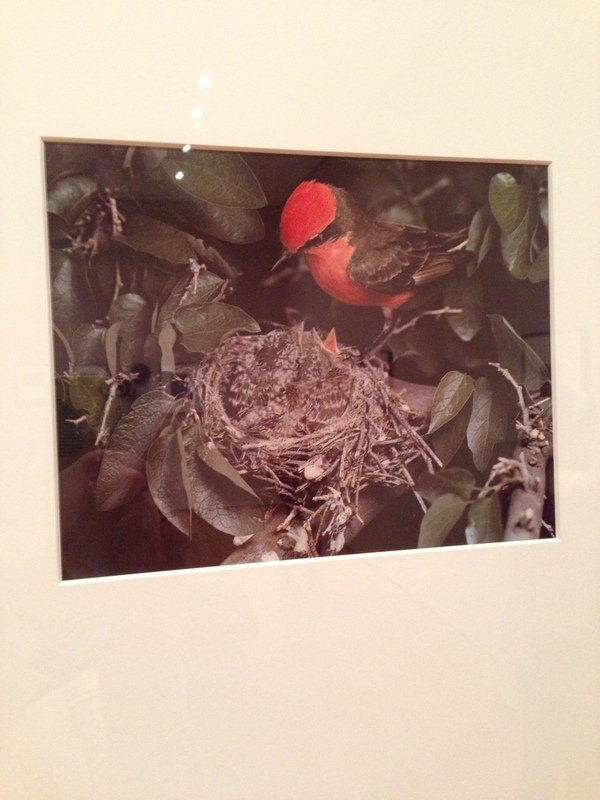 One room was filled with the brilliant photos of Eliot Porter, who shot them mainly in the ‘50s – all mother and baby birds in their nests, the young birds’ yawning, demanding mouths impossibly close up and crystalline. 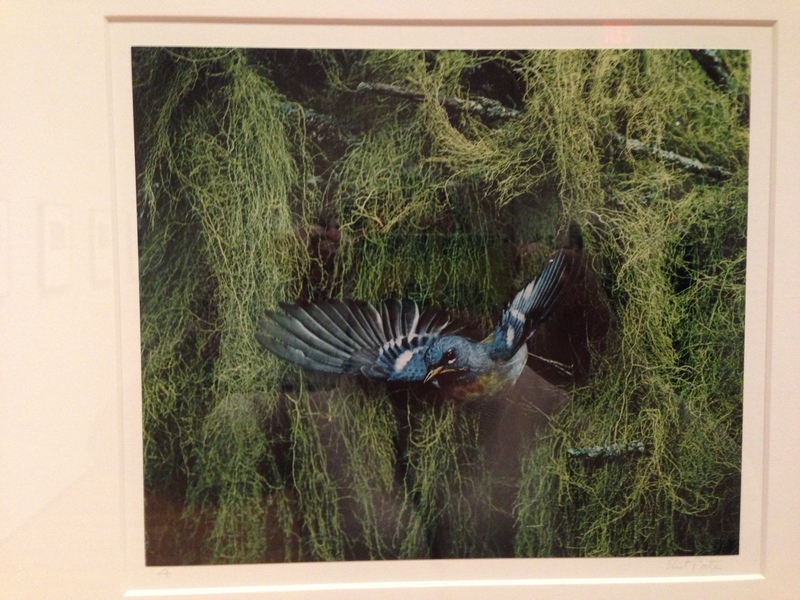 My photos of photos follow. We came out of the exhibit only to stumble upon a special showing of Munch’s The Scream, so mobbed by that time with photo-clicking tourists you could barely get a glimpse of the painting’s surprisingly light pastel tones – you imagine it as so gloomy and dark and it’s not at all in the flesh. Then, perhaps best of all, we found ourselves in a room dominated by an artist I wasn’t aware of before, Marcel Broodthaers, a Belgian who did his surrealist, literary thing in the ‘60s and ‘70s before his untimely death due to liver disease on his 52nd birthday. He designed his tombstone. 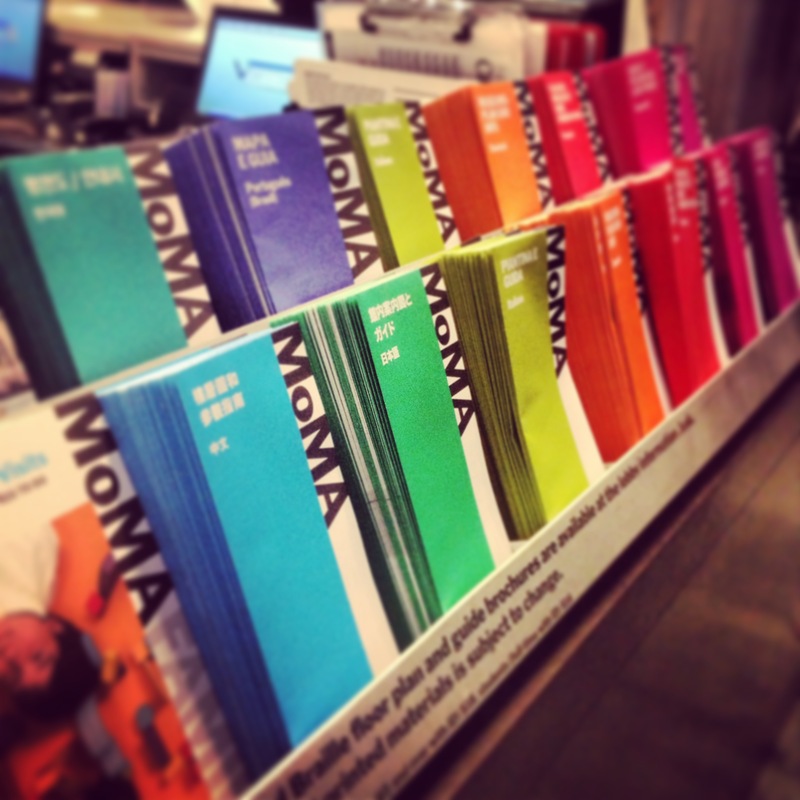 You could go into the Museum of Modern Art a hundred times and discover something new. First Broodthaers worked as a poet, then as a filmmaker, before turning to found objects and text as his means of expression. He had a few obsessions, mussel shells and museum exhibits among them – he glued the shells to boards and other surfaces, and created his own imaginary art exhibits. He fell under the spell of René Magritte, especially his movement-fomenting “La Trahison des Images (Ceci n’est pas une pipe)”, and created a wealth of pipe images (you can see one on Broodthaer’s tomb) in homage to the great surrealist. At MOMA there is a wall of metal plates like large license plates inscribed with pipes. 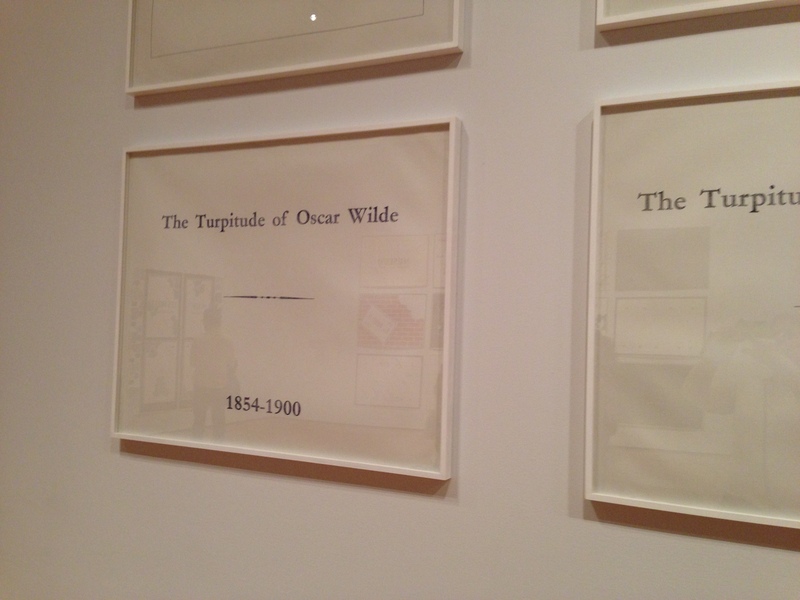 I love art based on text, so it’s no surprise I like this work so much. Somehow that idea of inventing something insincere strikes me as just about perfect as an artist’s goal. Washed down by hot coffee and flaky chocolate croissants, it was a day of heady inspiration. What an absolutely great idea! 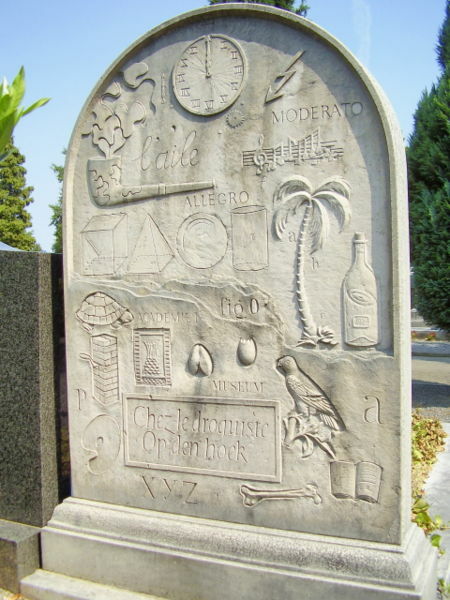 Designing your own tombstone! Or should that be tome-stone? Little play on words there … Honestly, the Egyptians had their tombs stocked with their favorite things, and to have one’s tombstone depict one’s favorite things in life would be a logical extension of that idea. 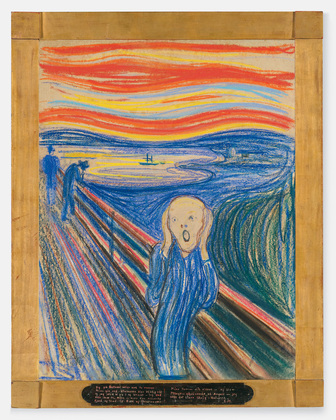 I had no idea ‘The Scream’ was done in less-than-garish tones. Considering the artist’s times and what he had to say after the work was created, I would have thought darker, starker colors would have been used.